I will post periodic updates about my graduation project, so you can read up on it if you’re interested. I try to explain why and how I’m doing what I’m doing. The explorative research has produced a truckload of information. While all very inspiring, it is a bit too much to take it all into account when starting up the design process. Therefore I will now report of a crucial step in my project: ‘from research to design.’ In this step, I have reviewed the research outcomes, and formulated a focus for the design phase. The literature research and explorative research have been conducted separately. The goal of the literature research was to form a scientific basis for this project, and the explorative research was conducted to find out more about the experience of adopting a happiness strategy. While both having been useful to their own ends, they had not yet been combined into one research conclusion. To try and bridge the gap, I reviewed the results of the explorative research to find links to theory. I did this by transcribing the two focus groups I’d organized, and making a cluster analysis of all the quotes of the participants. Their quotes could be grouped into themes, and these themes could sometimes be linked to some of the theory I’d found in my literature research. The research review resulted in five main insights. These are valuable since they represent theory that has been confirmed in practical research, and point out product opportunities. As was expected, a number of themes corresponded with aspects that Lyubomirsky calls the ‘Five Hows of Happiness’, which are basically a program of requirements for the successful adoption of a happiness strategy (Lyubomirsky, 2007). The quotes of the participants confirmed the importance of developing a habit, optimal planning and variety, required effort, acceptation, and person-activity fit. Participants reported on their changes in positive affect and happiness upon executing their strategy. Although influenced by many factors, the general experience seems to be the same. This is illustrated by the graph below. When evaluating the effect of the strategies, participants primarily reported a rise in positive affect, and in the awareness of their happiness. The question arises: Are happiness and the awareness of happiness the same thing? I would argue that they are, and that every time one is asked ‘How happy are you? 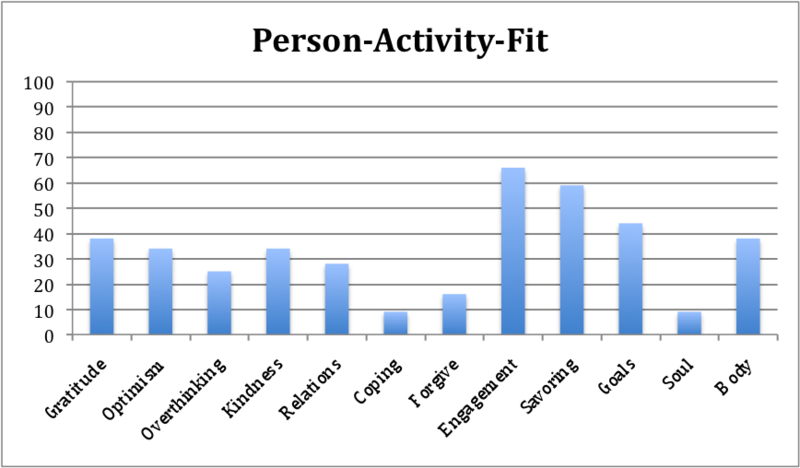 / What is your life satisfaction?’ one makes an appraisal of his life satisfaction. This appraisal can only consist of life aspects that one is aware of. Thus, by increasing the awareness of positive life aspects, the appraisal can be influenced, and one’s life satisfaction can increase. From the experience of the participants, a combination of active experimentation and reflective observation yields the best results. This insight can be linked to and supported by the experiential learning theory by American educational theorist David A. Kolb (1984). 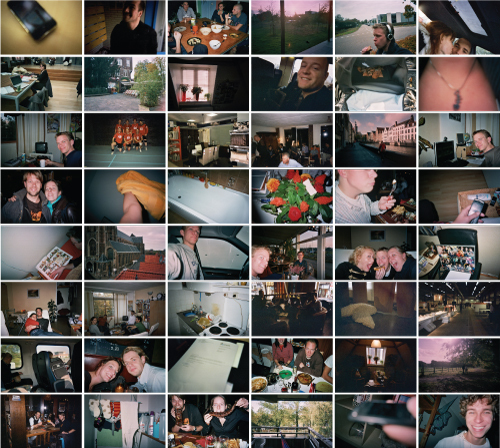 Just as in Kolb’s model, active experimentation allowed participants to experience new things, and reflective observation enabled them to translate these experiences into valuable lessons. 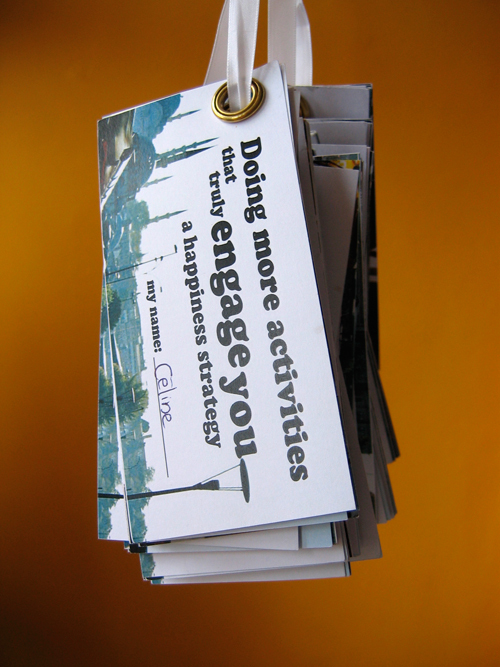 All the happiness strategies required the participants to change their behavior. Besides the requirements that Lyubomirsky mentions for adopting a happiness strategy, there is a more abstract framework that can clearly explain some of the experiences of the participants in changing their behavior. This is the model of behavioral change by Stanford professor BJ Fogg (2009). It claims that for any behavior to occur, there needs to be sufficient motivation, sufficient ability, and something that triggers the behavior to happen at a certain moment. During the exercise of the strategies, the participants experienced many emotions that influenced their experience. A critical point lies in the preparation phase of every intentional activity, as can be seen in the graph below. Upon deciding to work on their strategy, most participants received a boost in their positive emotions, and felt anticipation, wonder and hope. However, when realizing the commitment and effort that was necessary for the activity, positive emotions decreased. Furthermore, making plans and not exercising them produced negative emotions such as guilt and frustration. Sometimes participants would give up on the activity altogether. Managing one’s expectations and setting feasible goals proved to be key to increasing the chances of success. Achieving a goal often produced positive emotions such as joy, satisfaction, and pride. When expectations were surpassed, participants were positively surprised. Happiness can be defined as Life Satisfaction (Veenhoven, 2002). The appraisal of life satisfaction is a function of the awareness of life aspects and the perceived importance of life aspects. To increase either one of these would benefit the appraisal, and thus one’s happiness. 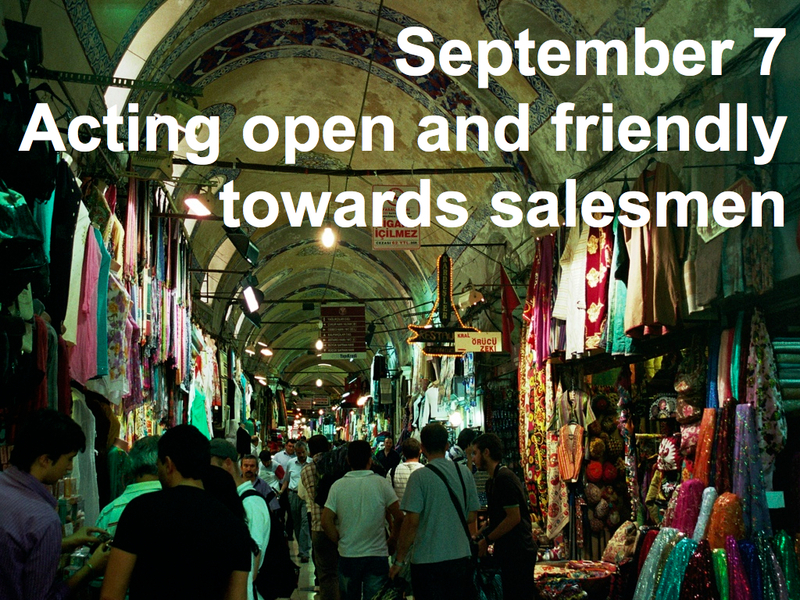 Opportunity in increasing ones happiness lies in changing ones intentional activities through happiness strategies. Some happiness strategies are social. Others are individual. Some are focused on thinking, some on doing. Yet the context research has shown that all include some aspect of active experimentation and contemplation, very similar to Kolb’s experiential learning theory. The product should stimulate active experimentation and contemplation of a happiness strategy, to allow the user to adopt the happiness strategy with success, and increase the awareness and/or importance of positive life aspects. 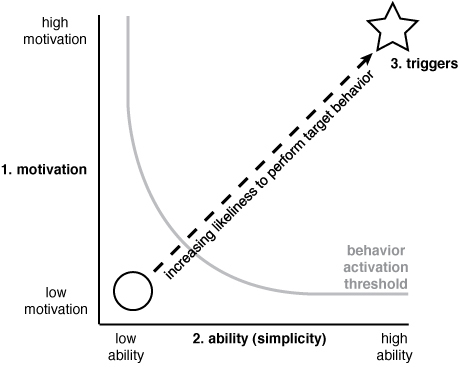 The product-aspects of motivation, ability and trigger will be developed to increase the persuasive quality of the product. The personas from the explorative research will be used as a frame of reference, for the evaluation of ideas and concepts. The five ‘hows’ of Lyubomirsky will be criteria for concept selection and the final prototype test and product evaluation. They can be reasonably quantified and tested, and will thus enable a conclusion to be drawn. The next phase of this project will be the ideation, where the first product ideas will be sketched. More to come very soon! – Veenhoven, R. (2002). Het grootste geluk voor het grootste aantal, geluk als richtsnoer voor beleid. Sociale Wetenschappen (4), 1-43. I have set up a small experiment in true Christmas spirit. I’ve made four piggy banks to save money for charity. These piggy banks (named ‘Een pot liefdadigheid’ / ‘One Jar of Charity’) should be passed from friend to friend, everyone contributing a small donation. When they have been filled, I hope to receive a call about it (contact information is printed on the piggy banks), so that I can collect them and donate the money to Unicef. Since the piggy banks may grow to contain considerable amounts of money, it is important that people pass it on to others whom they trust are up to the responsibility of passing it on. If we work together, we will be able to give Unicef this unique donation. 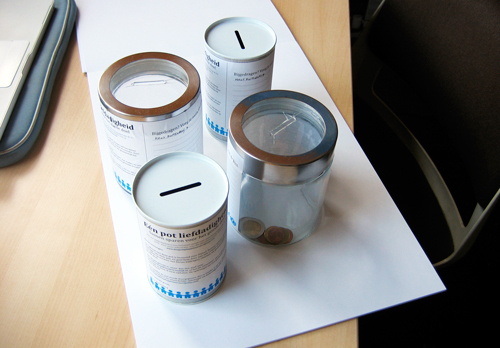 All contributors may write their name on a leaflet glued onto the piggy bank. Through this experiment, I am trying to study the dynamics of passing on items of value to others. When a piggy bank has been returned to me, I will post the results on this blog.